This reminded me of a twitter exchange, where we discussed various words for gene drive, which in French is “forçage génétique” or “guidage génétique” (which makes slightly more sense) and in German “Genantrieb”, for example. Using these words in normal French or German conversations would probably also result in blank faces. By contrast, English-speaking people, at least some, tell themselves that they know what gene editing or genome editing means; German-speaking people might imagine they know what Genchirurgie means, and French-speaking people might use the word edition génétique or génomique, thinking they know the meaning of the words they use. Using these words in normal conversations tends not to cause profound consternation. 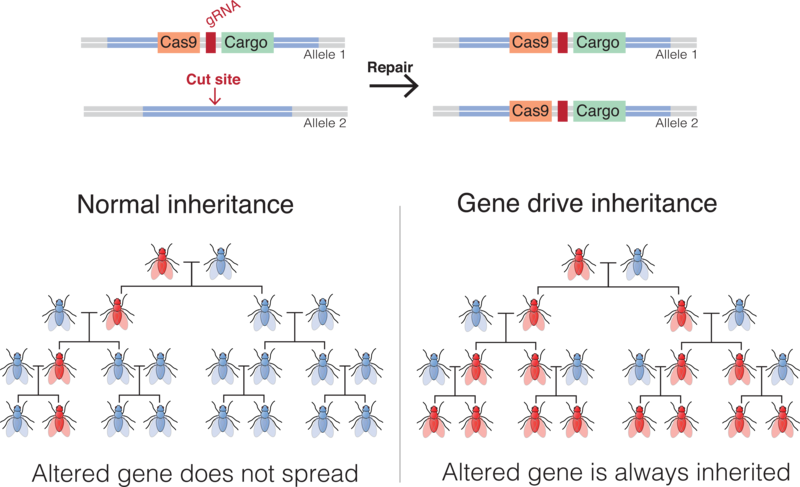 The phrase gene editing seems to be clear and transparent, while the phrase gene drive seems to be quite obscure and impenetrable. The meaning of the phrase seems to be entirely arbitrary. It is not, of course, but the reason why the phrase was coined is not accessible to normal language users. I once delved into the etymology of gene drive and almost plunged to my death, so to speak! So: what does that mean for science communication? How does one engage in gene drive communication when one stumbles at the first hurdle: the term: ‘gene drive’? Comments welcome! To establish mutual understanding, it is, of course, not enough that interlocutors know the meaning of words and, if possible, agree vaguely on the meaning of words. It is important to engage in real conversation in the first place. This involves: listening to each other; being aware of how the context and situation in which the conversation takes place shapes the meaning of the words used; exploring each others knowledge and understanding of the issue under discussion; trying to look at the world through the eyes of the conversation partner; and, of course, trying to speak and understand, as far as possible, the language of your conversation partners, in case they speak a different language. Only then can we engage in fruitful discussions of the risks and benefits of gene drives globally and locally. This is something my colleague Sarah Hartley has been trying to do in a project on gene drives funded by the British Academy (“Co-Production Across Disciplines and Borders: the Case of Gene Drive Mosquitoes in the UK and Mali”). She’ll be reporting on her experience in a separate blog post. Her work is contributing to the small but budding field of ‘gene drive communication’. There is, as yet not a lot of research available, on gene drive and science/popular/normal communication, apart from an article by Brossard et al. from November 2017 entitled “Promises and perils of gene drives: Navigating the communication of complex, post-normal science” (PNAS). The article states correctly that mainstream media coverage of ‘gene drives’ is still rather low, which means not a lot of people are exposed to the topic, contributing to the perplexed reactions that I encountered. In such a situation it will be difficult to engage in discussions about the ethics and impacts of ‘gene drives’, a common paradox for emerging technologies and responsible language use or responsible communication (see Nerlich and McLeod, 2016). The article further points out that American attitudes to gene drives will probably be influenced by attitudes to genetic engineering (p. 4). Again, this is a common problem with emerging but still speculative technologies where understanding has to be anchored in understanding of older technologies. I wonder though what attitudes will be like in countries which might benefit from gene drive technologies to eradicate, for example, dengue, Zika or malaria, but which also have to bear and think about the risks associated with these technologies. The article ends by giving scientists (and this rightly includes social scientists) and journalists advice on how to communicate about gene drives, focusing on care, nuance, balance and so on (p. 5). This is not entirely novel. In another part of the article, devoted to the role of journalists in communicating uncertainties, the authors stress: “Corralling and correcting misconceptions – and disseminating facts – is especially critical with a topic like gene drives because it is not only complicated, but untested.” (p. 2). I am not totally sure about the last clause, but it seems to me that not only journalists but also scientists, natural and social, should be involved in this enterprise. The spread of misconceptions can happen dangerously fast and misconceptions can take hold before ‘facts’ can get their boots on. We all have to keep a close eye on what we communicate and whether and how far that communication is based on trustworthy evidence. In this context, monitoring mainstream and online media for how communication about gene drives happens, where it happens, when it happens, who the main drivers or gene drive communication are will be an urgent task for social science, media and communications scholars. A small scale study by myself and others has looked at the metaphors around gene drives in the context of the Zika outbreak in around 2015/16, for example. With gene drives being used or tested or discussed in many non-Anglo-phone countries, such monitoring needs to be carried out in a multilingual and multicultural way. Inspiration could come from a recent article by Wirz et al. on Zika which includes researching “sentiment expressed about genetically engineered (GE) mosquitoes”. The authors of the article “Rethinking Social Amplification of Risk: Social Media and Zika in Three Languages” found not only differences in risk discussions between Facebook and Twitter but also between different languages, in this case Portuguese, Spanish and English. The authors therefore stress “the importance of multilingual approaches for risk communication research”.